Feedback can be used not only to tell test or quiz participants their final results but also to add tremendous learning value to formative and diagnostic assessments. 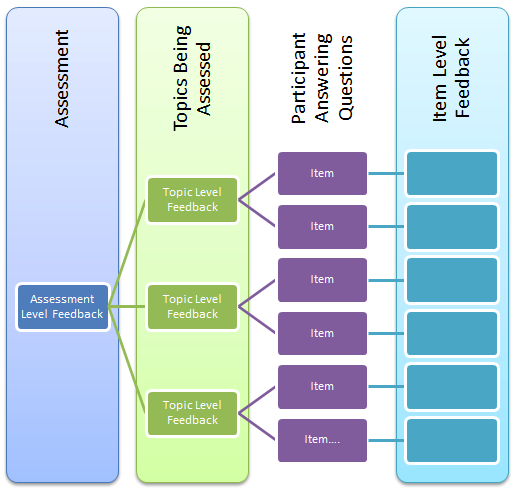 In a recent post in his own blog, our CEO Eric Shepherd describes three levels of feedback: Assessment Level, Topic Level, and Question/Item Level. He also explains the different types of feedback available at each of these levels. You can get some more advice about the use of feedback by reading this Jim Farrell’s previous post on this subject and checking out the feedback descriptions on our Web site. In talking with some of our customers last week, I was reminded how valuable it can be to offer participants topic based feedback. Obviously, everyone wants to know whether they’ve passed or failed a test. And most people look at their feedback on questions they got wrong, to understand how to improve. But you can get a single question wrong for many different reasons including misunderstanding the question, making a mistake or having a tiny gap in knowledge. However, if you score weakly in a topic area, it very likely means you have a weakness in that area that needs addressing. In many ways, topic feedback is the Cinderella in the feedback world. Everyone expects assessment level feedback and item level feedback (perhaps it’s unfair to call them ugly sisters because they are useful and valuable), but there is a huge and often untapped learning value in topic feedback. For pre tests, post course tests, quizzes during learning and practice tests particularly, topic feedback is vital. Suppose someone is taking an assessment in health and safety and they score 66% and this is a passing score. Sounds good! But what happens if, as in the screenshot below, they’ve scored very well in some topics and poorly in others? It’s obvious that you want to give people feedback on the topic level, but in many tools this isn’t as easy to set up as it should be. Questionmark Perception can be a fairy godmother for topic based feedback. There are lots of easy-to-use capabilities to present topic based feedback. Here are some links to support resources to help you create topic feedback in Perception. You can also make a topic a prerequisite for passing an assessment (for instance to prevent someone passing an assessment unless they get 60% or a specified score in key topics). If you want to display only some topics in the list and not all, for instance if some of your topics aren’t meaningful to the participant, you can define which topics are reported on. And then the feedback is displayed to participants at the end of assessment easily as in the screenshot above. I hope you find this useful in getting your topic feedback working and helping your learners achieve their full potential.